WHERE ARE YOUR WEDDING DRESSES MADE? Each of our gowns is lovingly designed and created in Australia. 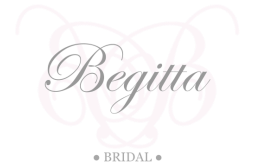 From the beginning to the very end your gown is crafted with love and attention from Begitta and our little team of professional seamstresses. HOW LONG DO YOUR WEDDING DRESSES TAKE TO CREATE? Our Custom Couture service is incredibly exclusive, we only take on TWELVE Custom Designed Gowns per year to allow for the incredibly intricate process from start to finish. When beginning a gown, the design process requires SIX to NINE months. This ensures a smooth process with all details covered and allows plenty of time for your fabrics to be ordered in and for any samples to be confirmed. Whilst your pattern and toile (prototype gown) to be created. Our Custom Couture Bridal gowns require 3-5 fittings according to the design and to ensure the bride is part of all the decision-making. Our fabrics are sourced from all over the world. A large amount of our laces and silked are sourced from Italy and France. Some of our specialized, custom-created fabrics are created in regions that specialize such as India, China and Indonesia. We have a beautiful range in studio and are able to source samples of all designs. Our fully Custom Couture Gowns start from $2500 for a simple design and can go up to around $5000/6000.00 depending on the intricacy and design aspects. We cannot compete with run-of-the-mill bridal boutiques who sources ready made gowns from China. Our process requires a lot of hands on work. Our Couture Experience includes 3-5 fittings, extensive communication and high attention to detail. Unlike many bridal stores once you place your order we will be there with you every step of the way. All prices are all-inclusive, you will feel confident you are in capable hands. All our Custom Couture Brides also receive a Welcome Gift Bag with access to our Exclusive Couture Brides Online Portal with heaps of great resources and inspiration. We have payment plans of THREE part payments (35%/35%/30%) with the second payment required prior to your ‘True Fabric’ being cut. CAN YOU REPLICATE A GOWN I WANT? Unless it is from our collections, we do not replicate/copy gowns. When custom making a gown, we aim to provide absolutely exquisite pieces that are unique and original. We cannot, unfortunately, copy a design completely but can always take your favourite elements of another gown and apply it to your one-of-a-kind creation. We want to make you stand out and be the only bride to ever own the masterpiece that will be your wedding gown! Depending on the intricacy of your gown and the design the process varies. We custom design your gown in your initial consultation. We put together your Dossier (portfolio) with all details, varying cost options, design sketch, fabric choices and prospective fitting timeline. For each of our clients we create a custom pattern to your measurements, the first fitting is a Toile (Prototype in a inexpensive fabric) to confirm everything fits as it should. From here we then cut your gown in its ‘True Fabric’ and from there your gown begins to come to life. We generally have 3-5 Fittings but allow more where required. At each fitting your gown is built around you and fitted to you perfectly. CAN YOU MAKE MY GOWN IF I LIVE INTERSTATE? To ensure every single detail is covered, Interstate brides must be able to physically attend 4-6 Fittings for a complete custom designed gown. However, where possible, 2 fittings could be held within a 3-5 day period. The initial design consult can be held via skype and fabric samples sent to you, however we do prefer in-person consults where possible. WHO SHOULD I BRING TO APPOINTMENTS? To your initial consultation we don’t recommend bringing along to many friends and family members. Having to many opinions can spoil your vision, the initial consult is to chat and relax and to really get down to what is important to you. Throughout the gown production process we encourage you to bring a friend or 2 to be a part of the process. Though we do recommend no more than 2 additional people attend your initial consultation. We also recommend leaving little ones at home, whilst we love children we have a lot of delicate and breakable items within our space. Suitable bra – preferably the bra/undergarments you wish to wear on your big day if any. Shoes – The heels/flats you will be wearing for your big day are a very important part of getting the hem to sit exactly where it should. If you haven’t purchased these yet we recommend a pair in the same/similar height as the shoes you wish to purchase. I’M INTERSTATE CAN YOU CUSTOM DESIGN A GOWN FOR ME? As the process of a custom designed gown is so intricate we can only accommodate interstate/international brides if they can confirm they will be available for a minimum of TWO fittings/visits. We can generally attend to all details within two fittings and encourage a bride to have 2 appointments within a few days of visiting us to fit in additional appointments (eg, 3 Day Visit with appointment on Day 1 and 3). 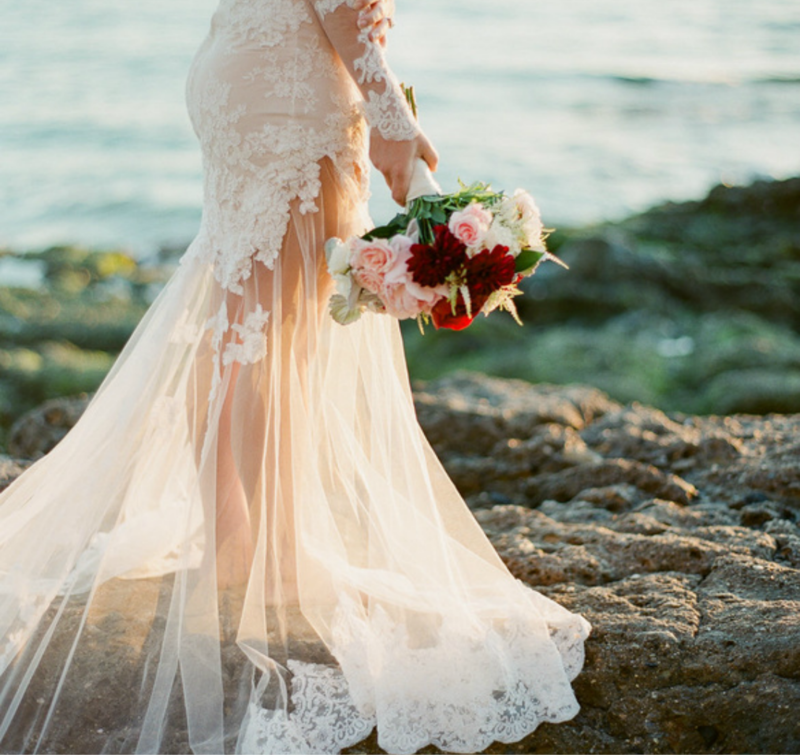 WHAT SHOULD I DO WITH MY GOWN AFTER MY WEDDING? We recommend having your gown professionally cleaned by a reputable dry-cleaner. Your gown should be delicately stored in acid-free paper and away from dampness and sunlight.